Prova d’ Orchesta (2010) is a video conceived as an homage to the film of the same name by Federico Fellini (1979). Invited to a dinner with an expedient, the orchestra members become the unaware protagonists of Zeneli’s work. Deeply characterized by a motion-picture image, Prova d'Orchestra sets out from the casualness of the events that occur during the evening. Through the perky and frisky relationship between the orchestrals and the music, the gaiety of a dinner en famille, as well as the shots and the baroque-like image, Zeneli focuses on the shifting and displacement of meaning - and of its potentialities - that permeate his research. 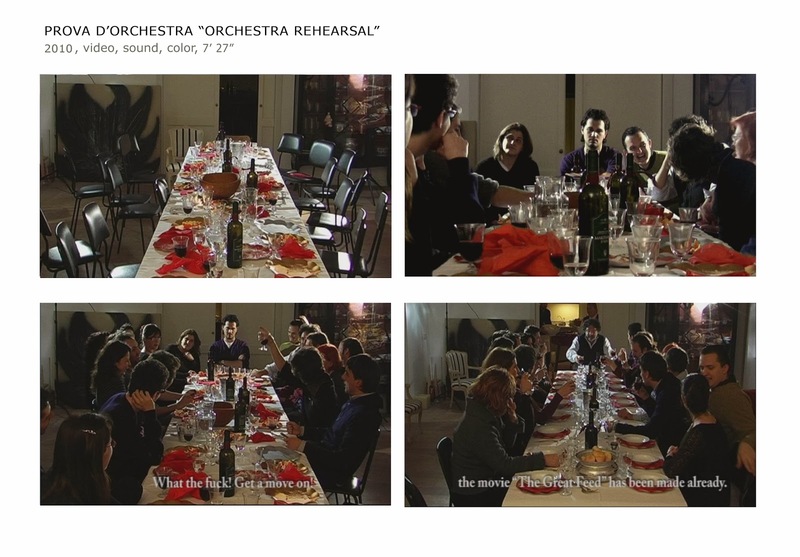 Prova d’orchestra (Orchestra Rehearsal) video, 2010, 7’27”, color, sound.